We held the first event in the Bradfield Seminar Series – a lecture by Mr Dave Sharma, former Australian Ambassador to Israel (and Bradfield resident), speaking on the topic “Making Sense of the Middle East: Opportunities and Challenges for Australian Foreign Policy.” There was a strong roll up of Bradfield constituents who were treated to a fascinating and authoritative presentation explaining the geopolitics of the Middle East. Mr Sharma’s insights as a former diplomat were especially valuable. Following Mr Sharma’s presentation, there was a lively Q&A session. Thanks to Dave Sharma for giving this presentation and to our generous hosts Roseville College. The Bradfield Seminar Series will comprise occasional public lectures on contemporary and important issues given by a speaker with distinctive expertise. Look out for notice of the next event in the series, later this year. If you would like to be put on the mailing list to be alerted of future events, please contact my office on 9465 3950 or email me at [email protected]. Last night I hosted a community meeting in St Ives to provide an update on the progress of the Turnbull Government and to take comments and questions from constituents. It was encouraging to see more than 60 people attend and take a keen interest in the work of the government. Issues that were discussed included energy reliability and affordability, Labor’s tax refund slug, aged care and cost of living. If you would like information about my next community meeting, please don’t hesitate to contact my office on (02) 9465 3950 or email me at [email protected]. I was pleased to join in Chinese New Year festivities in Chatswood Mall. As usual there was a big roll up for this important event. In my remarks I highlighted the important contribution to modern Australia made by Australians of Chinese background – and nowhere is that contribution stronger than on the North Shore. The colourful Lion Dance was once again a crowd favourite – and a wonderful way to welcome in the Year of the Dog. On Saturday morning I spent some time at Wahroonga shops meeting constituents and listening to their concerns. Some of the issues raised included the NDIS and local traffic flow around the Wahroonga area. Keep an eye on my Twitter @PaulFletcherMP to see where I’ll be doing my next listening post. I don’t think there is a better day to be a politician than Australia Day. To see the joy that new citizens take in becoming Aussies on our national day, and to feel the palpable sense of national pride at community events, is a great privilege. My 2018 Australia Day started at Bicentennial Park in West Pymble where I spoke at the citizenship ceremony and congratulated our new citizens. Then it was time for a wander round the Park, where many families from the local area enjoying the animal farm, the Australian Reptile show and arts and crafts stalls. Moments after becoming Australian Citizens, husband and wife Vernon and Zuzana shared a few thoughts with me on what becoming a Citizen means for them and why they love Australia - one reason being meeting each other on the tennis courts of the North Shore. After that it was up to Hornsby Mall where the Australia Day festivities highlighted the vibrant multicultural community, including with traditional Indian dancing. 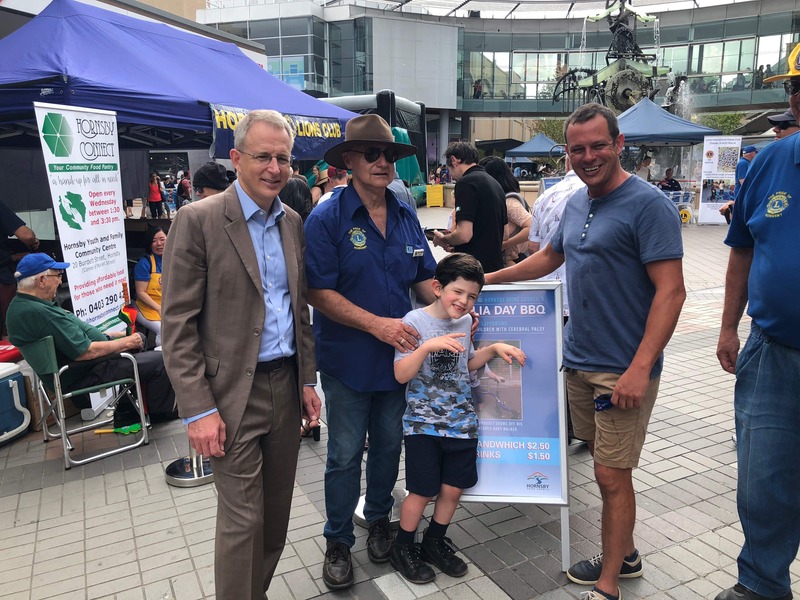 I also got behind the BBQ with Hornsby/Ku-ring-gai Lions Club volunteers raising money for Walk Talk Fly, a foundation established to support children with cerebral palsy, such as young Jackson Kelleher (pictured). I recently attended a large number of End of Year Award Ceremonies and Presentation Days at schools across Bradfield including Asquith Girls’ High School, Turramurra High School, St Ives High School, Killara High School, Ku-ring-gai High School, West Pymble Public School and Turramurra North Public School. At each of the High Schools I provide the Member for Bradfield’s Prize for Citizenship each year. I recently hosted Community Drinks in the Electorate Office to celebrate a year of extensive community involvement, service and volunteering. Hornsby Ku-ring-gai Women’s Shelter, Easy Care Gardening, West Lindfield Sport and Recreation Club and the Ku-ring-gai Historical Society were among numerous community organisations in Bradfield that were represented. I held a community meeting at the Roseville Club this week to talk about the policies that the Turnbull Government is pursuing, and take questions from constituents. A diverse range of topics were discussed including infrastructure, urban planning, energy policy and border protection. Paul attended the Remembrance Day Service held at the Cenotaph in Hornsby, where he laid a wreath to honour the servicemen and women who died and suffered in all wars or armed conflicts, and reflected on the freedom we as a nation enjoy today. The occasion, organised each year by a committee of veterans and members of the Hornsby RSL Sub-branch, was well attended by local residents, school students, local and state government representatives and members of Australia’s Defence force – both past veterans and those presently serving. Paul participated in the Bare Creek Trail Run in Garigal National Park in St Ives finishing 4th in the 50-59 yr olds category with a time of 35:19 in the 6km course. Paul ran alongside many locals of all skill levels – from families to veteran runners. The Bare Creek Trail Run has been a vibrant community event over several years. The course starts and finishes at Acron Oval in St Ives and winds through a beautiful bushland setting. This year nearly 1500 people participated in the 2 km, 6 km, 10 km or 15 km events. This weekend Paul visited the Sunset Soaring Club in Wahroonga and the Eryldene Historic House in Gordon. Both of these community organisations were the recipients of a grant under the Turnbull Government’s Stronger Communities Programme. This programme is a government initiative which provides dollar-for-dollar assistance, up to the value of $20,000, to community organisations to undertake capital works projects which benefit the community as a whole. Sunset Soaring Club is a radio-controlled flying club that flies at Golden Jubilee Oval in Wahroonga. Operating for over thirty years, the club encourages anyone with an interest in flying radio-controlled aircraft to get involved and meet people with like-minded interests. With a substantial fundraising effort from its members, the club secured a grant from the programme to build a storage facility for their equipment, allowing the club to grow in size. The Eryldene Trust is charged with maintaining the Eryldene Historic House in Gordon, the most intact surviving example of the work of William Hardy Wilson, the prominent early twentieth century Australian architect. In recent years, the roof of the house has required repairs in order to prevent water damage to the inside of the house. Through fundraising, and a Stronger Communities Grant, the Eryldene Trust and the Eryldene Foundation were able to repair the roof, ensuring that future generations can experience all that Eryldene has to offer. Paul participated in the Annual Sydney Adventist Hospital Fun Run ‘Run for Life’ at the SAN in Wahroonga. Paul has been a regular participant in the SAN Fun Run since 2009, competing this year in the 5km race. The event was a great success drawing many people from across Bradfield, including families and young children, to run or walk around the leafy streets of Wahroonga raising money for the new SAN Rehabilitation Unit, a first of its kind for a private hospital in Sydney. The new 48-room Rehabilitation Unit assists patients recovering from joint, cardiac or spinal surgery and will build on the widely respected service that the SAN provides to residents throughout Bradfield.